The Evergreen State Fair is successful each year largely because of the many individuals who dedicate countless hours to making sure every booth, display, shop, show or activity runs smoothly. Virtually all of these volunteers do it without the expectation of recognition or pay, but instead are motivated by the impact the Fair has on youth, education, and community. 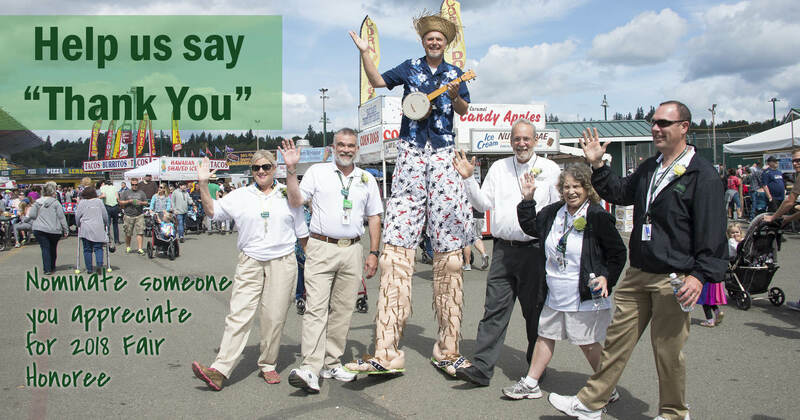 For this reason, the Evergreen State Fair Advisory Board selects one individual each year to be celebrated as the Fair Honoree. If you know of an individual in the community who has spent significant time and energy making the Fair a fun and educational place for all, please consider nominating them as the 2018 Fair Honoree. Submissions are due January 31, 2018 and the Fair Honoree will be announced at the Fair Kick-Off Dinner in March 2018. The recognition includes many highlights: the Honoree will ride in the Monroe Fair Days Parade; be the guest of honor at the Opening Day Ceremony; and be highlighted in the Fair Program. For a list of previous Evergreen State Fair Honorees, click here.